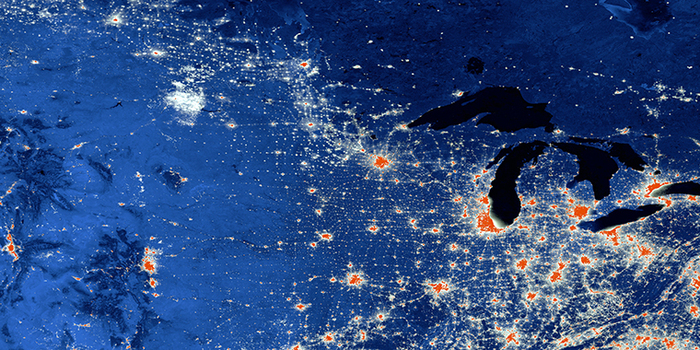 Brenner and Katsikis, Nighttime Lights and Population Density in North Dakota, 2016. Copyright: the artists. This book builds upon theories of planetary urbanization to evaluate the limits and potentials of remotely sensed data and other forms of geospatial information as a basis for mapping urbanization processes. Against the prevalent trend towards cartographic positivism, in which such data are presented as neutral, photographic "captures" of ground conditions, our analysis reveals the hidden, pre-empirical interpretive assumptions that mediate the construction of geospatial maps. The book offers, first, an accessible overview of the main sources of geospatial data on urbanization, the technical procedures through which they are constructed, and the underlying metageographical assumptions upon which they are based. Second, on this basis, a theory-driven approach is proposed to interpret the effects of geospatial data on urbanization. 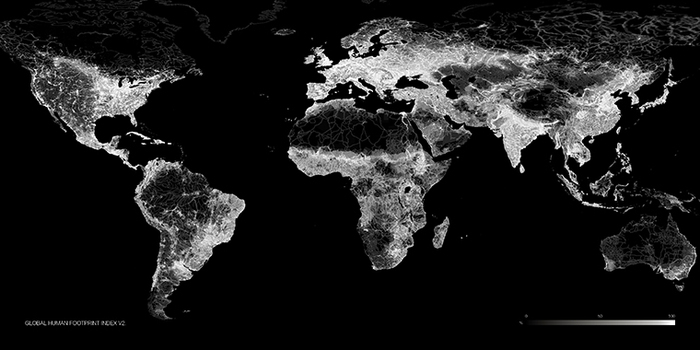 Building upon this ongoing work on planetary urbanization, the project presents new metageographical frameworks for visualizing the worldwide urban fabric, including through the theoretically reflexive application of geospatial data. Neil Brenner is professor of urban theory at Harvard University’s Graduate School of Design. His most recent books are Critique of Urbanization: Selected Essays (Bauwelt Fundamente/Birkhäuser, 2016) and the edited collection Implosions/Explosions: Towards a Study of Planetary Urbanization (Jovis, 2014). His previous books include New State Spaces (Oxford University Press, 2004) and several volumes on the need for a critical approach to urban questions, including Cities for People, Not for Profit, coedited with M. Mayer and P. Marcuse (Routledge, 2011), and Spaces of Neoliberalism, coedited with N. Theodore (Blackwell, 2002). Brenner directs the Urban Theory Lab at the Graduate School of Design, a research group that uses the tools of critical urban theory, geopolitical economy, and radical cartography to decipher emergent patterns of urbanization. Nikos Katsikis is an architect and urbanist working at the intersection of urbanization theory, design and geospatial analysis. He is currently a postdoctoral researcher at the University of Luxembourg, where he is collaborating in setting up a new program in architecture, european urbanization, and globalization. He holds a DDes from the Harvard's Graduate School of Design, where he is also affiliated with the Urban Theory Lab, and where he has also served as an instructor in urban planning and design (2014–15). He is on the editorial board of New Geographies and coeditor of New Geographies 06: Grounding Metabolism (Harvard University Press, 2014). He received a professional degree in architecture with highest distinction (2006) and a master's degree in architecture and spatial design (2009) from the National Technical University of Athens. His recent work includes contributions in MONU (2014) and Implosions/Explosions: Towards a Study of Planetary Urbanization (Jovis, 2014).